CD contains both Windows and DOS versions. Windows version. 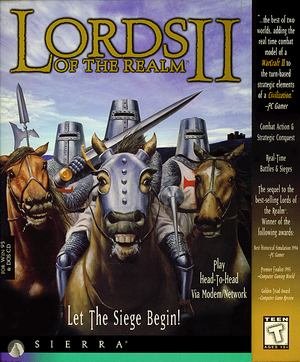 Includes the Siege Pack expansion and Lords of the Realm. Delete or rename Intro.smk. The game will now go directly to the main menu. Game must be running in 256 color mode. Sierra Internet Gaming System option no longer works. Right-click on the shortcut to the game and click Properties. Check Run in 256 Colors and Run in 648x480 screen resolution. ↑ 2.0 2.1 File/folder structure within this directory reflects the path(s) listed for Windows and/or Steam game data (use Wine regedit to access Windows registry paths). Games with Steam Cloud support may store data in ~/.steam/steam/userdata/<user-id>/397350/ in addition to or instead of this directory. The app ID (397350) may differ in some cases. Treat backslashes as forward slashes. See the glossary page for details. This page was last edited on 28 March 2019, at 00:33.